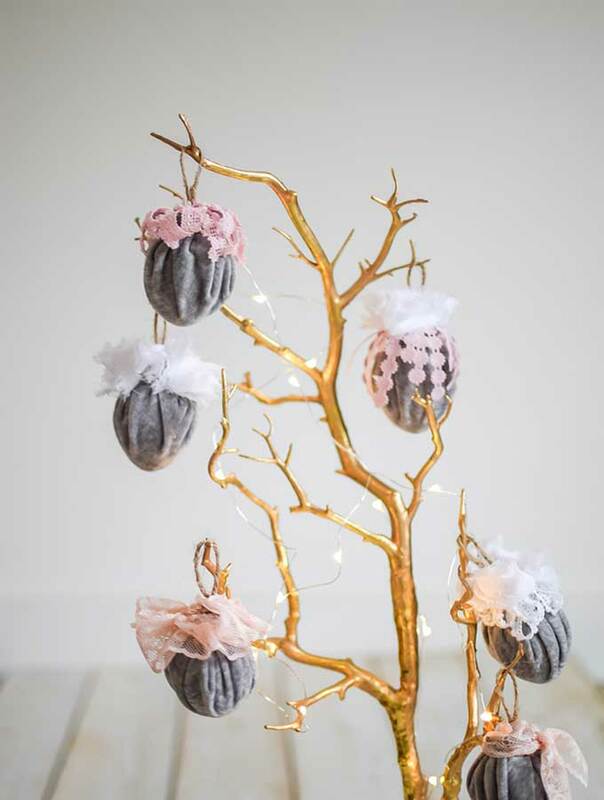 On an earlier post we showed you how to make velvet Easter eggs, so today I wanted to show you how we can style these eggs 5 different ways. Of course you can use any kind of egg for this, if it’s decoupaged, store bought, or dyed yourself. Styling with Easter Eggs/5 Ways is a lot of fun and you can get creative in how you want to style yours! 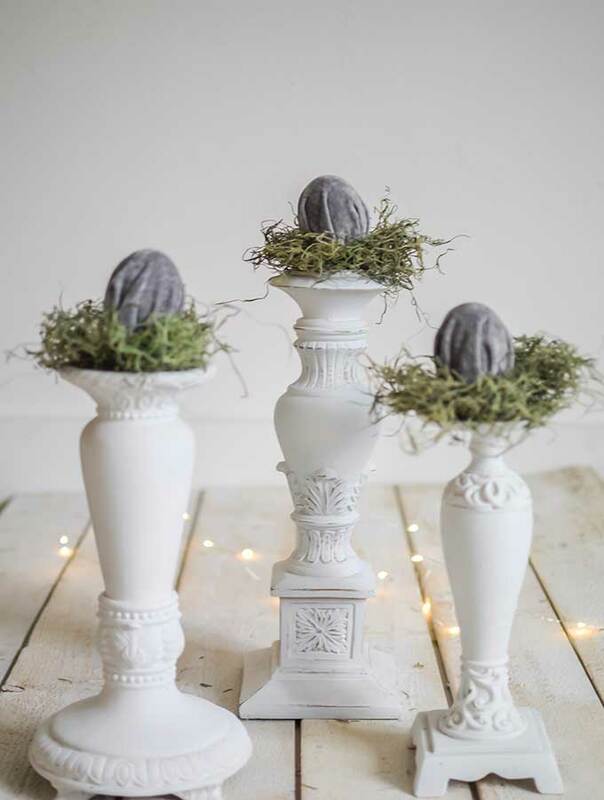 When first creating these velvet Easter eggs, I knew I wanted to put them on some candle holders. So that’s one of the first things I did. But keep on reading to see how I got even more creative and added a fun twist to these eggs. 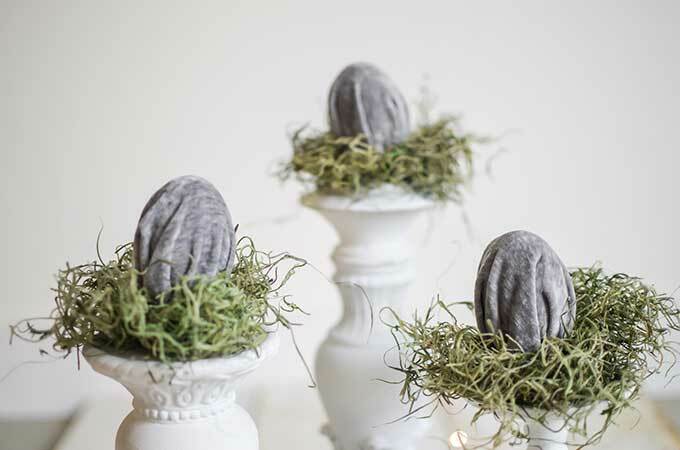 Dress up your Easter eggs by adding moss to the base. It really adds another element to the look. If it was just the eggs it would still be pretty, but very bare. So that’s why I added moss. 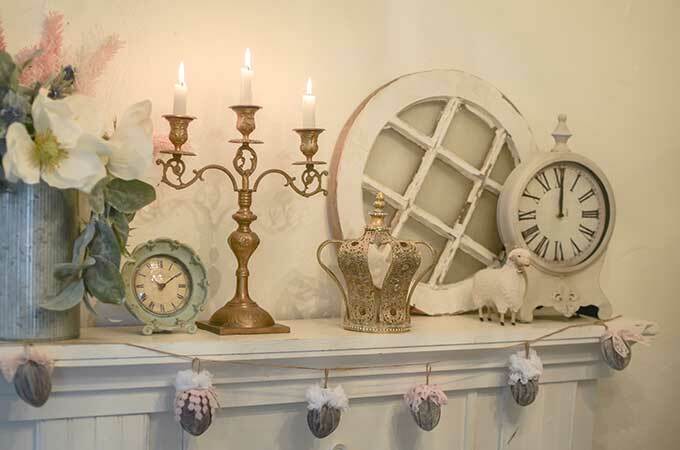 Moss also is perfect for adding to Spring decor. The next idea also involved some moss, but this time the eggs were placed in a tray. This is a shabby chic tray I had laying around that was the perfect look with these eggs. 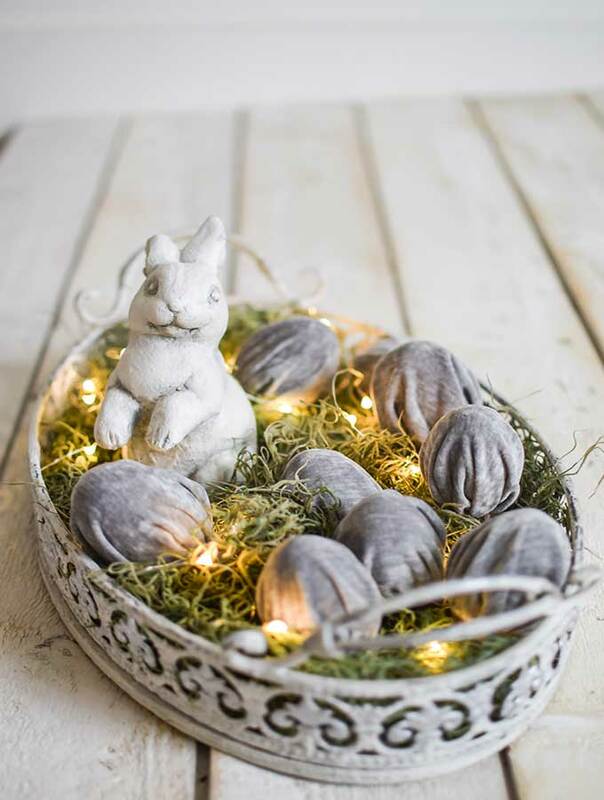 The velvet Easter egg tray would look perfect for a Spring tablescape. If you need some tablescape inspo I created a Spring table with a few easy desserts. 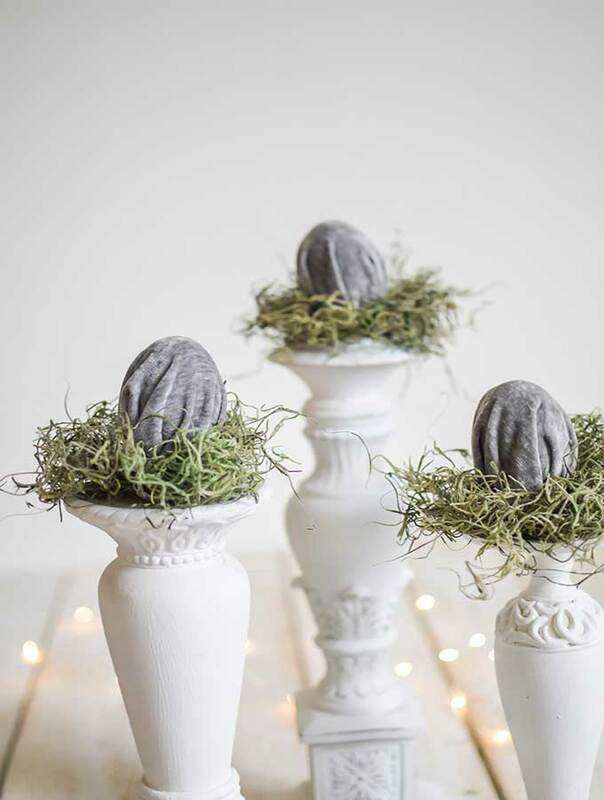 The fun twist we did to the velvet eggs was to make them a bit more shabby chic. Getting some lace trim and a few small fun ribbons, we glued them onto the tops of the eggs where the bunch of fabric is. They didn’t turn out the best, but they’re still pretty cute. 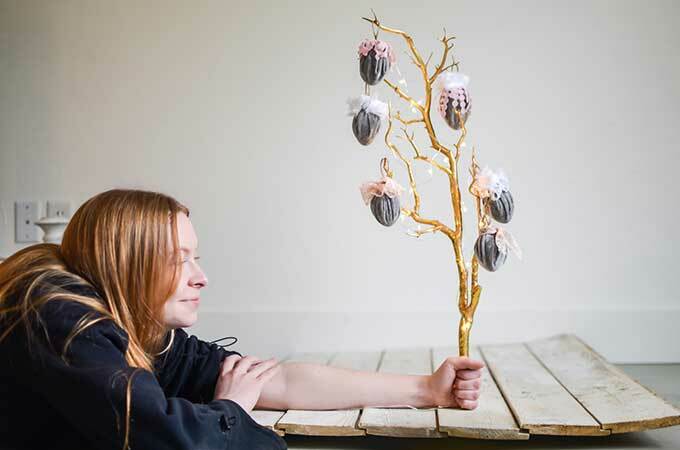 Also perfect for an Easter egg tree. Adding some twinkle lights to our tree makes it more whimsical. Claire and I came to the conclusion that our little shabby chic eggs look more like heads with a bad hair day. But we still rolled with it as we usually do around here. But we then decided we wanted the next create a garland out of our eggs. 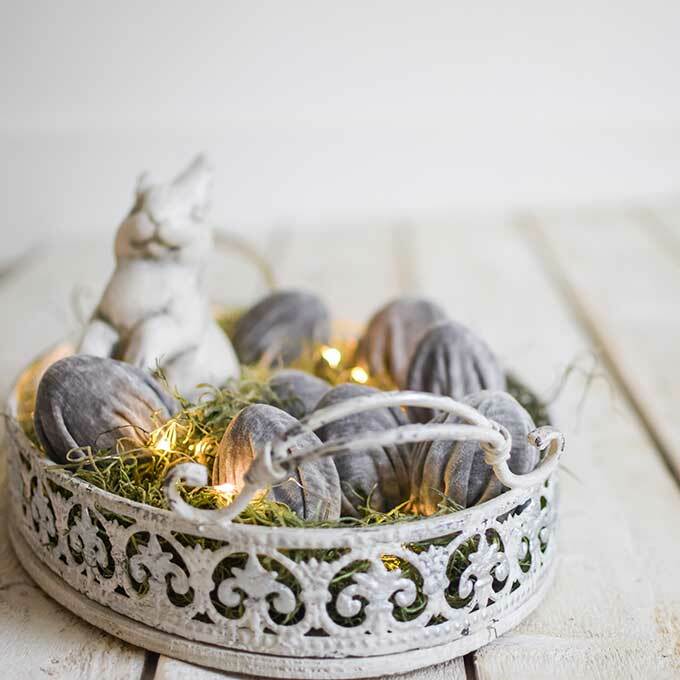 Which is actually super cute for a simple Easter touch to your home. 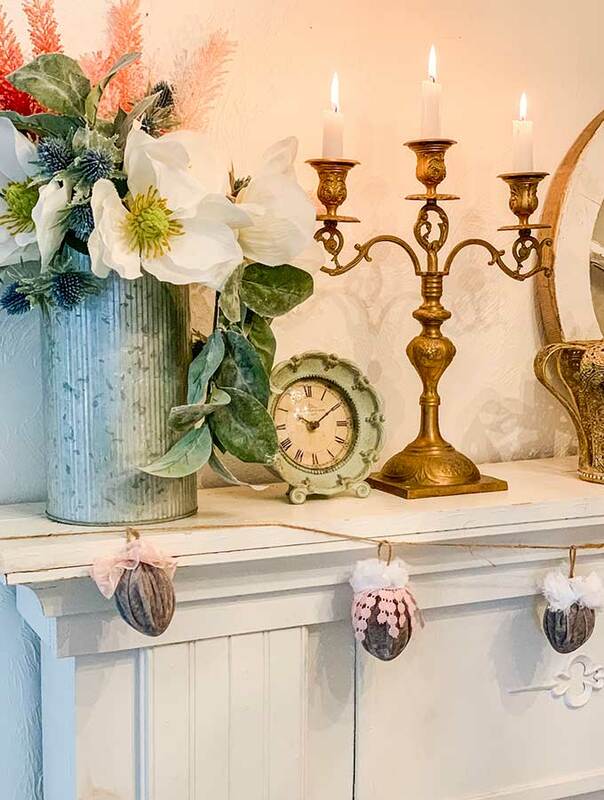 Coming up with 5 different ways to decorate with velvet Easter eggs was super fun! 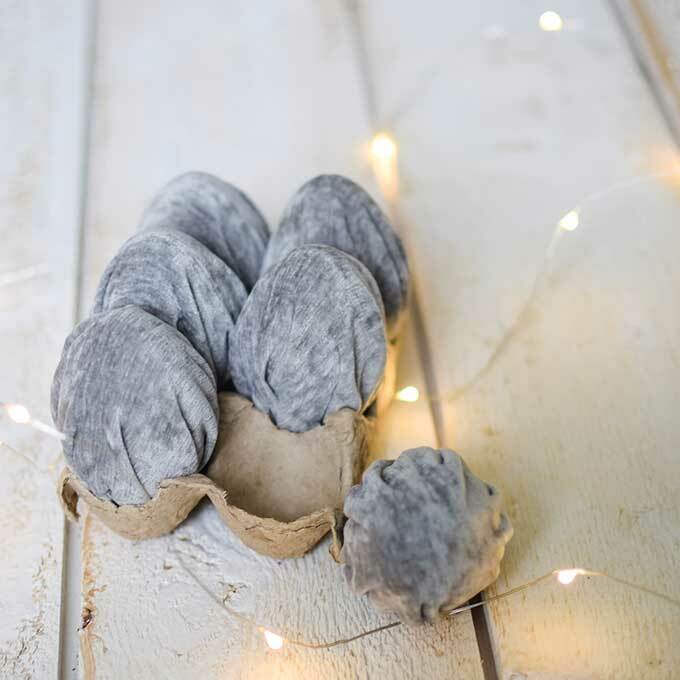 How would you decorate with these velvet eggs? Another pretty way to decorate with them, would be to put them in a clear vase for a centerpiece. Now for the Easter egg wreath. Ok, I know I didn’t use the velvet eggs. The things is, I already added my shabby chic touches of lace and it just didn’t work for this wreath. But if you decide to make a velvet egg wreath I would love to see it. So tag me on Instagram so I can see your velvet egg creations. With some cute speckled eggs I made a moss and floral egg wreath. 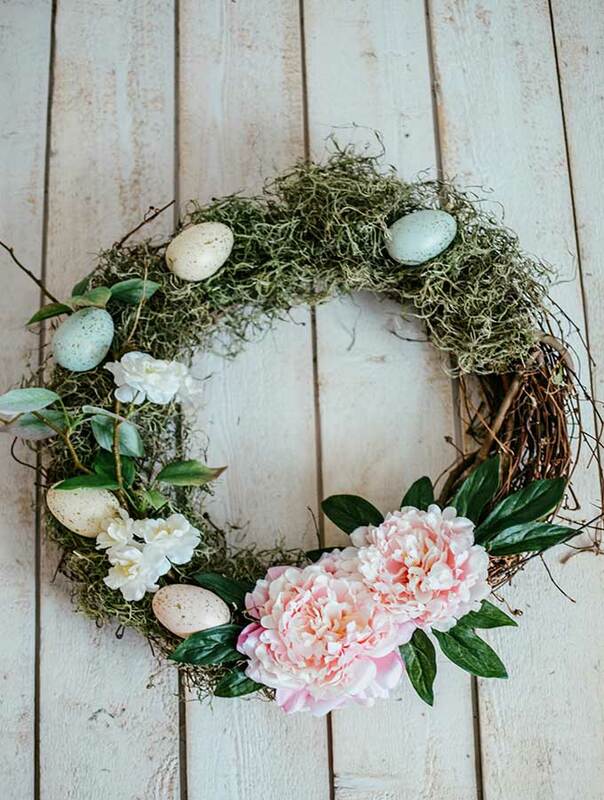 This wreath is great for Spring decor and it will be sure to brighten up your home. 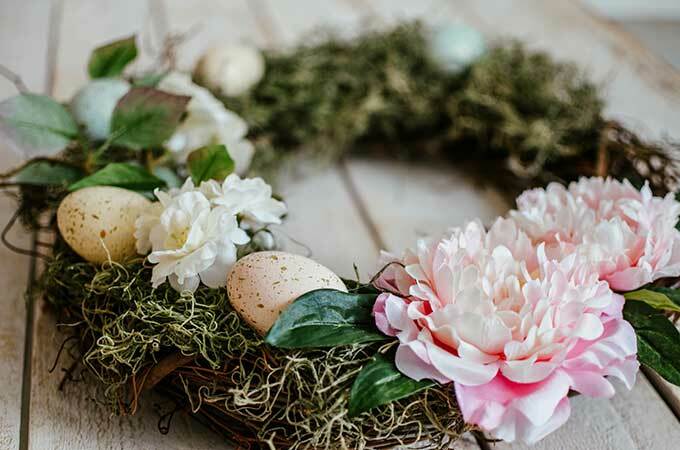 If you want to see more details on how I created this I have the easy Easter egg wreath diy. I’m serious these are super easy to create. It doesn’t involve many supplies and you can get really creative when decorating with them. 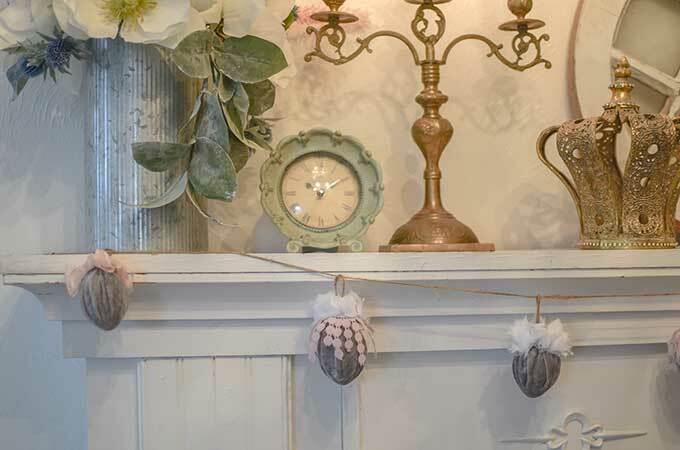 Making velvet Easter eggs is fun too, as you can create with any fabric or colors you’d like. Thanks for stopping by. Happy Spring! Looks like so much beautiful. Definitely will try to make it. Thanks for sharing this nice post and please keep it up. Thank you Karen! Have fun!